Via the AV Club, a surprisingly interesting read about someone who is not a Zappa fan but giving Frank an honest try. I, too, have shrugged off Frank Zappa. Not just his post-1967 work, but all of it. 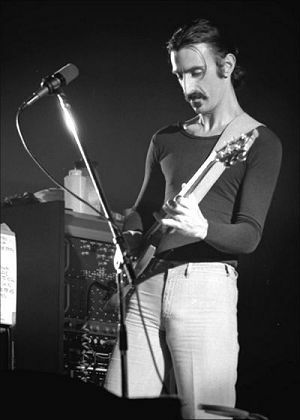 I’ve even used “Zappa” as a kind of mocking shorthand for the sort of music I usually don’t like (noodling, zany, self-indulgent) despite never giving his records much in the way of close study to confirm whether that prejudice even rings true. Zappa was right: That’s my failing, not his. I haven’t just approached his stuff with a closed mind—I haven’t really approached it at all. And who knows, maybe somewhere inside his enormous, intimidating discography, there’s something I’d like if I just gave it a shot. After all, I like music. From the opening bars of “Suction Prints”, we knew we had entered The World of Captain Beefheart and that was exactly where we wanted to be. There it was, that unmistakable fast ‘n bulbous sound, the sudden shifts of meter and tempo, the slithery and stinging slide guitar in tandem with propulsive bass, the polyrhythmic drumming giving the music a swing unlike any other rock band.